Winter Tyres Now In Stock! In Ireland, we know that the weather can be ever changing and come winter, it can really start to cool down. When the roads get wet, icy and snowy – they obviously become much more dangerous. Things like slowing down and even steering can become much more difficult. Winter tyres have a different tread pattern which is designed to be much more efficient in icy conditions. The fact that they are also a softer tyre, means that are much more flexible and can adhere to the road much better. Call into one of our depots today, we will be more than happy to provide you with more information. You can even avail of a tyre health check when you are in! Winter Tyres can help you stop in wet, muddy or slushy conditions. Winter Tyres are designed to operate best at 7 degrees Celsius or lower. If a car is travelling at 20mph Winter Tyres would help it to stop 11 meters shorter than Summer Tyres. 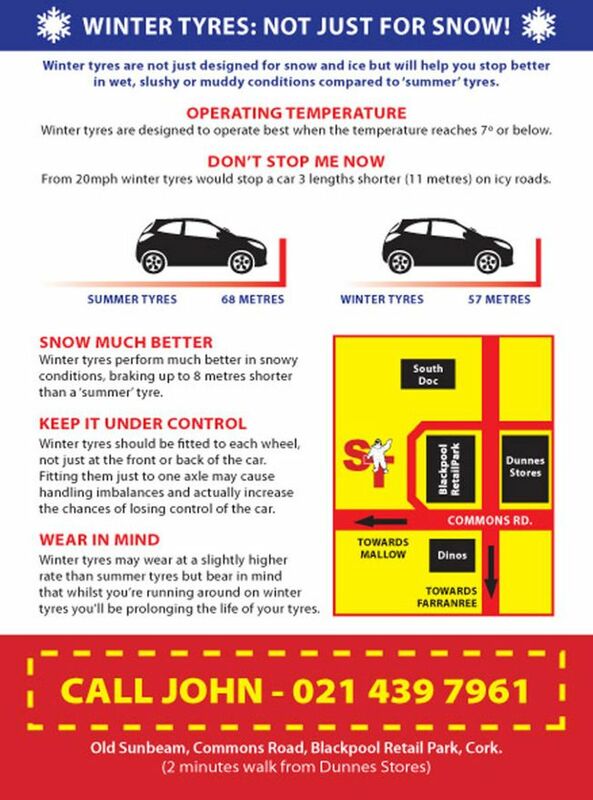 In snowy conditions Winter Tyres can stop up to 8 meters shorter than Summer Tyres. Winter Tyres wear slightly quicker than Summer Tyres, so it is important not to leave them on all year round. Fitting of tyres purchased with us to your car. Store your summer tyres for winter for free*. Swap tyres back for next summer. *We will store your tyres for free for winter/summer and only charge for fitting and alignment.